This full day event, attended by 30 participants from around the UK, was held in York St John University. It was organised by CILIP’s Academic Libraries & Research Group’s Yorkshire & Humberside branch. This talk gave an overview of a session delivered to students jointly by careers (Sarah) and the library (Stevie), under the umbrella of ’employability’. As well as finding out about the content of the session, it was interesting to hear about student attitudes to social networking in terms of career development. The slides used by Sarah and Stevie to give this talk were the same slides used with students (take a look below), which gave an outline of what employers will look for on social media and how students can take control and manage their presence more, for example by checking Facebook privacy settings. Students don’t use twitter much and it certainly doesn’t occur to them to use it to develop their careers. Students think LinkedIn is only for when they’ve got a job, not to get one. Students should Google themselves regularly. Sarah speaks to graduate employers on a daily basis – they are saying they are googling candidates so you need to know what they are seeing. Career development is not just about social media, this needs to be complemented with traditional methods eg face to face. Sarah recommended looking at university.linkedin.com which includes resources and videos on how to get the most out of LinkedIn. Students are now asking for help with checking LinkedIn profiles more than CVs, as a result LMU ran drop-in LinkedIn clinics. Students need to observe etiquette – don’t link to people you don’t know. Conversely, be careful of linking to family, you may end up with your mum talking to potential employers! Michelle described The Final Chapter online resource which supports students completing their final year projects. The resource was developed in response to a curriculum review which emphasised the need for independent research skills, resulting in the requirement for all final year students to do a project. The Final Chapter was developed collaboratively between staff and students. Michelle admitted it is unashamedly text heavy as it is intended to have detail and depth. Created using Articulate Storyline, the site contains checklists and embedded videos of staff and students. Academics from all faculties were interviewed and videoed explaining what they wanted from a literature review and what they expected in terms of criticality. Students were asked to share their tips. An interesting discovery was that the purpose and process of a literature review is the same across all subjects, despite what might be claimed! Once completed The Final Chapter was marketed mainly via a staff launch event but also through channels such as twitter. There have been over 20k hits to the site but evaluation has so far been limited. A survey has been sent out but unfortunately not many responses were received. The “Doing a Literature Review” section was most and least popular – some subjects don’t do a formal review so the resource may need to be adapted in future. Other possible developments might be to include specific real-life examples, bringing in subject differences more and adding sections on methodology and discussion. Emma described the support they give to visiting school children who are working on their EPQ projects (Extended Project Qualification accredited by AQA – this short video explains its aims). Visits to the university library take place in spring and summer and the toolkit was developed to standardise the delivery of the sessions, as they are delivered by all members of the library team. The toolkit includes session plans, ice breaker activities, searching activities, quizzes and tutorial material, finishing off with ‘DIY’ time to work on projects. The searching activities cover advanced Google searching including domain searching – Emma has found that students aren’t aware of these options or why you might use them. Google Scholar, journals and citation, and open access resources are explained. I liked the ‘higher/lower’ game used to get students to guess how much journals cost – they are shocked at how expensive they can be! The quiz is an activity which provides a self-guided tour around the library, which is in addition to a brief guided tour given by staff. 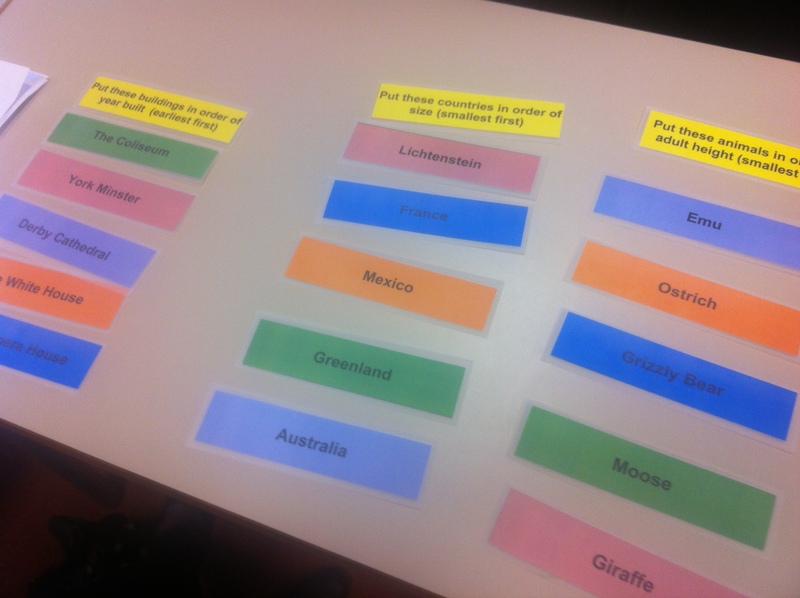 We got to try out one of the ice breaker activities (below), which at first seemed like a simple ranking exercise, for example, “rank these countries in order of size”. However, discussion led to us questioning the task itself – what exactly do we mean by size? Area? Population? The importance of asking the right question was emphasised. After the visits to the library, students can use the library on a reference-only basis. They can also ask for an inter-library loan on to use items in school, but at present there hasn’t been much demand for this. Emma said she often turns down visits to go out to schools to run the sessions – she feels its important that students actually come into the library to experience what university life is like. All courses at Leeds Metropolitan University have recently been reviewed and this provided opportunities to embed digital literacy, which is one of LMU’s three graduate attributes (the others being global outlook and employability). These opportunities included Futures Fest, a 3 week event in January which is dedicated to work-based learning & employability. The links between digital literacy and increased employability were demonstrated through activities such as creating scenarios which demonstrate how research skills can be used to help find a job. Erin then described the implementation of Core Content Modules within Blackboard, which can be embedded within other modules. She felt it was important that digital literacy is a graduate attribute, as it becomes everyone’s responsibility. Her slides below give more details of her experiences. Vivien Sieber, ‎Head Learning and Research Support and Development at Surrey, gave an overview of Open Education Resources and Creative Commons and their advantages. She introduced JORUM, the repository for sharing OERs, and noted the forthcoming information literacy category (at the time of writing this now exists, with 78 resources listed under ‘Information and Digital Literacy Skills’). She then explained the rationale behind Surrey’s Skills Portal, aimed at undergraduates, taught masters and doctoral students. Librarians signpost students to the portal to complete tutorials, with a view to spending the face-to-face time providing more in-depth and personalised support. Vivien highlighted the importance of selecting appropriate OERs and overcoming technical issues to do with re-use. One of the main problems was encouraging students to use the resources and felt recommendation was key. Miriam then talked about her experiences of repurposing a JORUM object from the University of Birmingham. It was easy to adapt in terms of content as it was fairly generic. Vivien emphasised the importance of uploading to JORUM too – it’s not all about re-using, but also sharing. And in that spirit, she noted that all of the Surrey Skills Portal is available to use under a Creative Commons licence. Video | This entry was posted in Digital literacy, Information literacy, Reports. Bookmark the permalink.